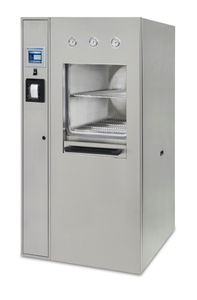 Our reputation for reliability, quality and safety is built into every sterilizer so your operation will enjoy maximum uptime. All sterilizers incorporate a solid silicone door gasket that can be easily replaced without tools or adhesives. We also utilize non-proprietary valves that are often available from local suppliers. These features, plus industry renowned quality, ensure the lowest cost of ownership in the industry while maintaining the highest standards of sterilization. Our Advantage Series™ Programmable Logic Controllers are built using proven industry-standard components that provide dependable performance, solid reliability and international parts availability.